Tolerance: Specified Dimension -0" + 0.006"
The Boschert Classic Series Safety Chuck has been the standard of the industry since Boschert invented the Safety Chuck in 1948. 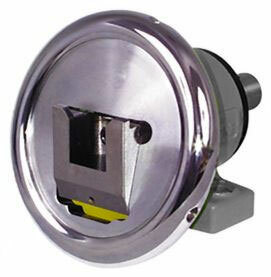 This is a rugged Safety Chuck with lots of capacity built in for future upgrades. The concentricity of this unit is comparable with the Boschert Value Master. These units feature square openings case hardened to Rockwell 56 C. This Safety Chuck series is best suited to slow running unwinds and winders. The Boschert Safety Chuck design employs a tilting hand wheel to lock the end of the customer’s square journal in the square opening of the Safety Chuck. This is a superior design because it allows the load bearing surface of the customer’s journal to be closer to the first set of bearings in the Safety Chuck housing. Other Safety Chuck designs require room behind the load bearing area of their Safety Chuck. They need the space to allow a locking collar or cam to move back in order to exchange journals. Such design places the load bearing area of their Safety Chuck farther away from the first set of bearings. This outboard design causes greater stress to the Safety Chuck drive shaft and any eccentricity to the roll shaft is magnified in wear to that design Safety Chuck. 14-20 330 29 1350 20mm and .75"
19-25 880 90 1350 25mm and 1"
22-30 1760 130 1350 30mm and 1.25"
30-40 3520 250 1350 40mm and 1.5"
40-50 6200 800 1350 50mm and 2"
50-80 15400 1700 1100 80mm and 3.125"
80-120 26450 7300 900 120mm and 4.75"
120-180 48500 14800 700 180mm and 7"
170-200 70546 18500 500 200mm and 7.875"
170-230 141092 30300 500 230mm and 9"